This professionally designed and decorated Scottsdale vacation rental condo is located in the McCormick Ranch area of Scottsdale, just off of the 101 Loop and Mountain View Rd. Situated within Scottsdale’s prestigious McCormick Ranch, Rancho Antigua has direct access to McCormick Park’s greenbelt, where visitors can enjoy rollerblading, biking, walking, and jogging. Offering privacy and relaxation, your home-away-from-home is just minutes from upscale boutique retail and hip restaurants at renowned Kierland Commons, as well as West World of Scottsdale, a premier, nationally recognized equestrian center and special events facility, hosting Scottsdale's Arabian Horse Show, Barrett-Jackson Collector Car Auction, and concerts. Antigua is located close to Interstate 101, so Sky Harbor Airport is just 12 minutes south. This is a great location in the McCormick Ranch area of Scottsdale not too far from MLB Spring Training, Salt River Fields at Talking Stick, the Talking Stick Casino and Resort, Talking Stick Golf Course, Kierland Commons, Phoenix Sky Harbor International Airport, and Chaparral Dog Park. Boasting three community swimming pools, a recently remodeled clubhouse (with deck and lagoon), fitness center, sauna, and lighted tennis court, this Scottsdale vacation rental condo is the place to be. The Admiral’s House is a one-story end unit with no neighbors above. 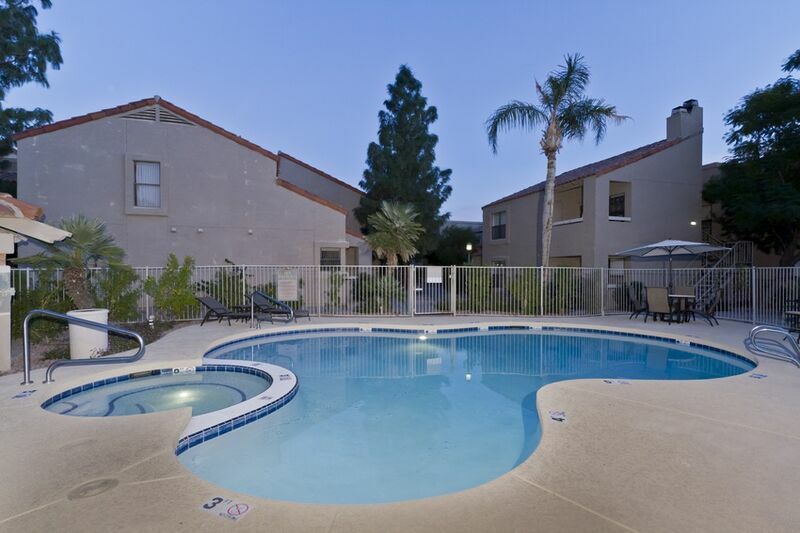 It is centrally located within the complex and steps from the tennis courts, clubhouse, and fitness center. This spacious 3 bed/2 bath unit went through a full renovation when recently purchased. The remodel included new tile flooring throughout, new carpet in the bedrooms, new appliances, new baseboards, new lights, new sconces, new faucets, new bathroom sinks, new counter tops in the bathrooms, new ceiling fans, and new paint. Walking through the front door of this first floor unit, you enter the Living Room of this spacious Scottsdale condo. The tile flooring looks like distressed hardwood, and is easily kept clean. The walls are painted a tan color and the ceilings, baseboards, and doors are bright white. Fall into the ultra-comfy sleeper sofa and use the radio frequency universal remote to turn on the 42” flat screen that is mounted above the fireplace, or throw in a DVD. The media center is hidden in a closet by the front door and includes the cable box, modem, wireless router, and DVD player. The living room is furnished with a modern feel and includes a tan sleeper sofa, chocolate brown club chair, coffee table, and corner table. The room is tied together with artwork and accessories to make you feel at home. The French doors from the Living Room lead to the outdoor dining area with round table and four chairs with cushions. Be a spectator as you will have a view of the tennis courts, sip your coffee as you enjoy the cool Arizona morning, or watch the twinkling stars at night. There are two steps on either side of the fireplace which lead to the Dining Room. The Dining Room has a sleek white table with seating for six in high back cushioned chairs. Mix up your favorite cocktail at the bar or pour yourself a glass of wine. Continue on to the wide open Kitchen which has granite countertops, maple cabinets, black-on-black appliances, and everything you might need to cook up a meal and entertain. The Kitchen is light and bright as there is a window in the corner above the kitchen sink. Around the corner from the Kitchen is the Master Bedroom includes a king size bed (Simmons Beauty Rest pillow top mattress), two dark brown nightstands, two bedside lamps, a dark brown dresser for your folded clothes, and a white chair to put your shoes on before you get the day started. Watch the news from bed on the 32” TV that is mounted above the brown dresser. The cable box sits on top of the brown dresser. There is a walk in closet in the Master Bedroom as well. Next to the king size bed is the entrance to the Master Bathroom, which has tile flooring, Caesar stone countertops, and dark maple cabinets. The vanity area of the Master Bathroom includes two large vanities, each with its own sink and cabinet space. A door in the Master Bathroom leads to the water closet, which includes a shower behind a sliding glass door and the toilet. The two other guest bedrooms are on the other side of the condo. The first guest bedroom is furnished with a queen size bed, two nightstands, two lamps, and a dresser to put your folded clothes. There is also a flat screen TV mounted on the wall. The second guest bedroom has a blue accent wall and is furnished with two twin beds with headboards, a console table, a lamp, and a dresser. There is also a flat screen TV mounted on the wall in this bedroom. In the hallway is the Guest Bathroom. The Guest Bathroom includes a dark maple single vanity with a beautiful white Caesar Stone countertop, a bathtub/shower combo, and a toilet. Behind double doors in the hallway is the washer, dryer, iron, and ironing board. Nearby, visit high-end retail shopping, world class restaurants, a variety of cultural activities, MLB Spring Training, or head out running or biking to enjoy Scottsdale’s abundant sunshine.